(Left) Engine No. 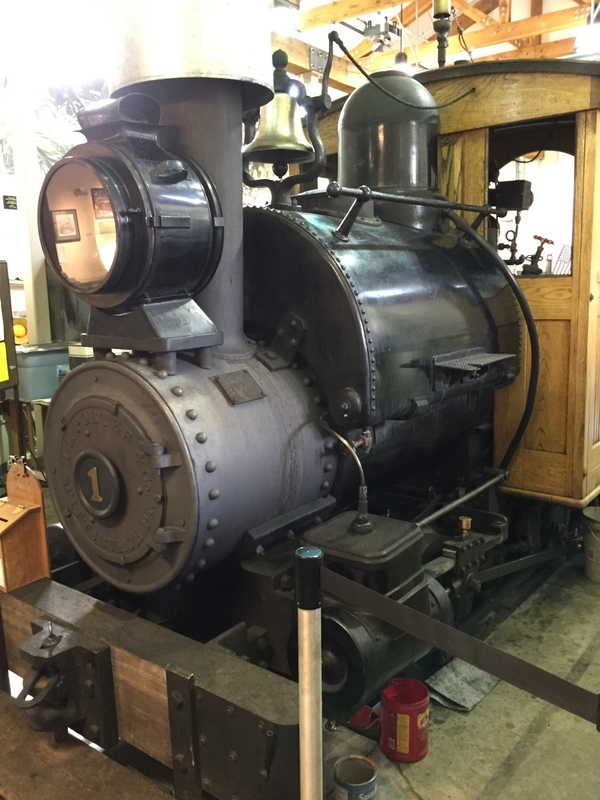 1, a 0-4-0 ST 8.5 ton steam engine was built in 1899 at the H. K. Porter Locomotive Works in Pittsburgh. It arrived at Chena, Alaska in 1905 for use on the Tanana Mines Railway, later the Tanana Valley Railroad, until 1922. 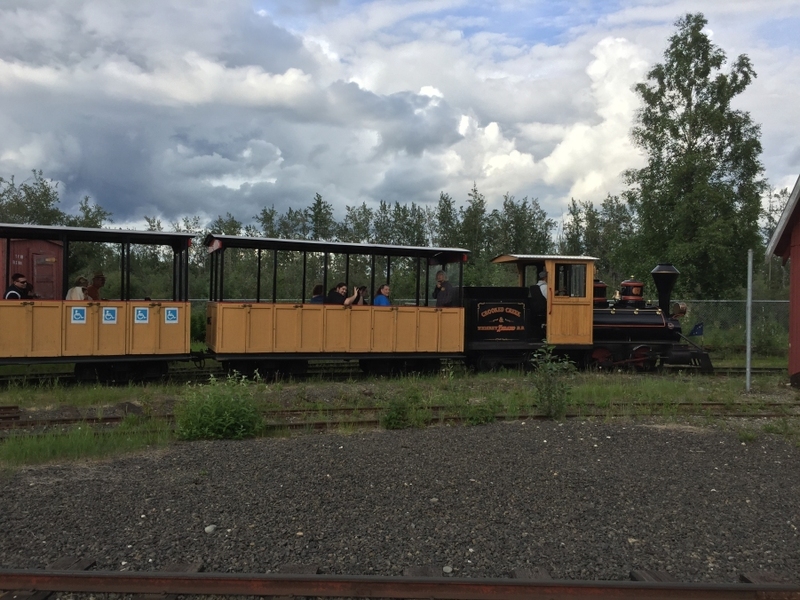 It was rescued by the Friends of the Tanana Valley Railroad and restored to passenger service in 2000. (Above) A sister engine to No. 1 gives rides around Pioneer Park. 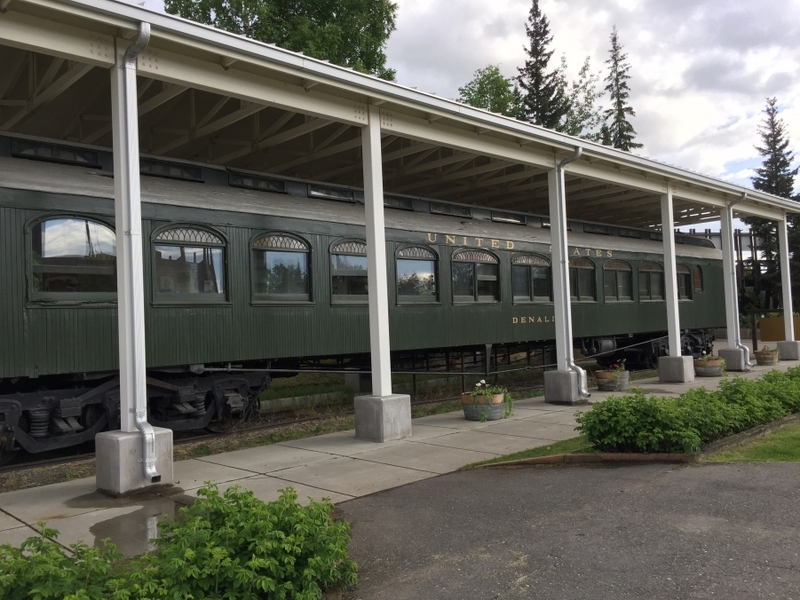 The Harding Car, AKA the Denali Car, was used by President Warren G. Harding in 1923 when he came to Alaska to drive the Golden Spike marking the completion of the Alaska Railroad. Side View of the Harding-Denali Car. Harding was the first U. S. President to visit Alaska. 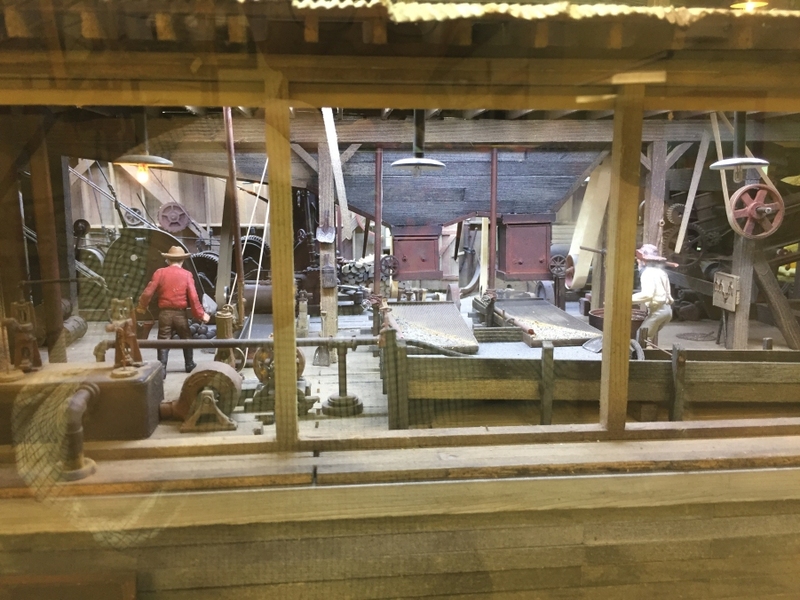 The Pioneer Historical Museum contains exhibits that cover many aspects of the history of the Interior of Alaska, including its mining history. 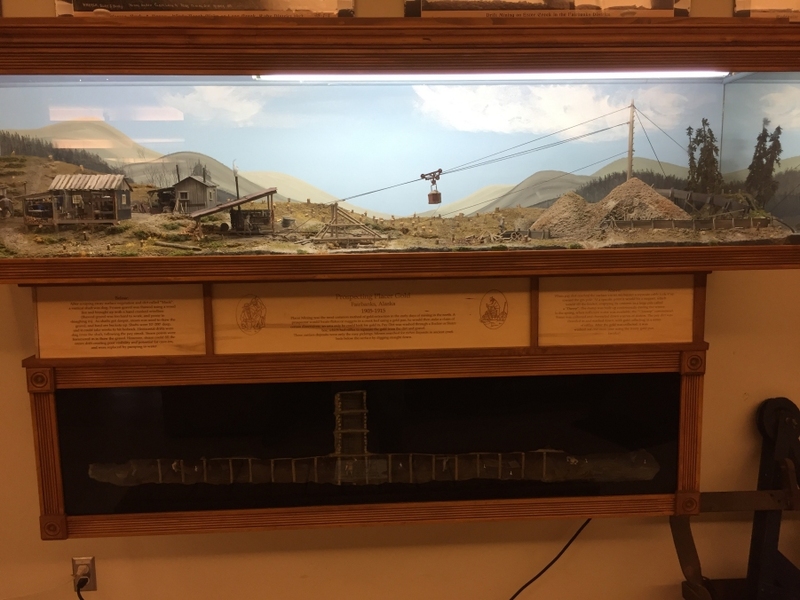 A series of detailed mining models illustrate different mining methods such as underground placer mining shown above. Dredge mining is shown in the model above. CLICK HERE to see a close-up view of the interior processing plant of the dredge. 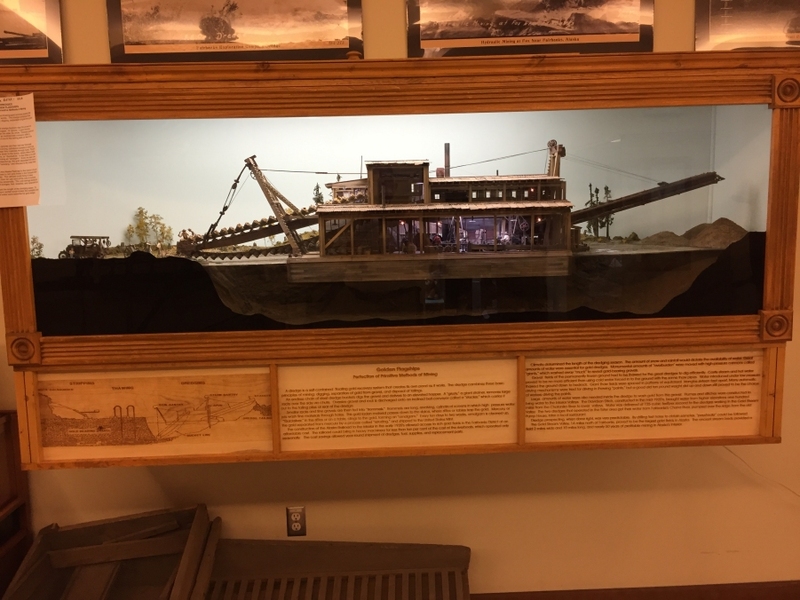 David Lyons, a master model-maker, constructed these fine models as well as those of the Alaskan towns on display in the sternwheeler STR Nenana. 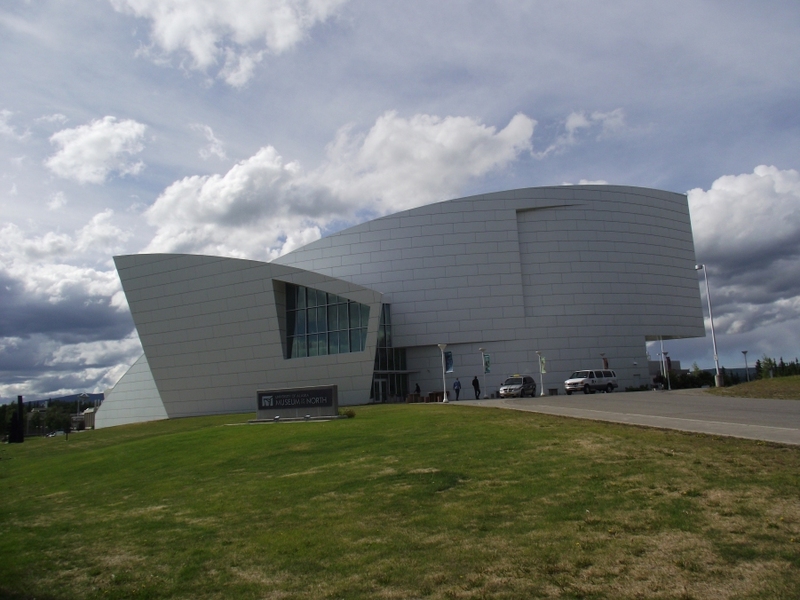 (Above) The Museum of the North was just steps away from the MHA Conference venue and well worth a visit.Permanent exhibits cover Alaska’s natural and cultural history. Additional gallery space is used for art collections and installations. 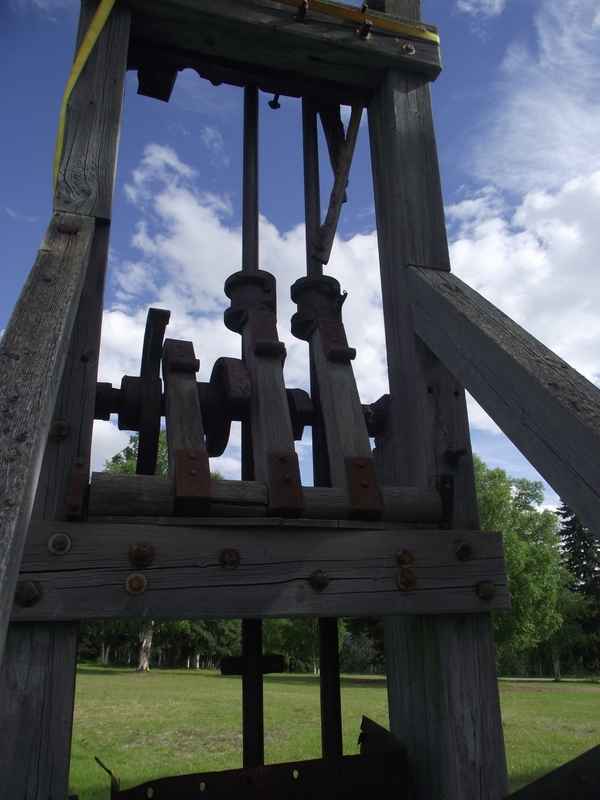 (Right) An historic three-stamp mill (ca1911) manufactured in a local foundry is located on the grounds of the museum. 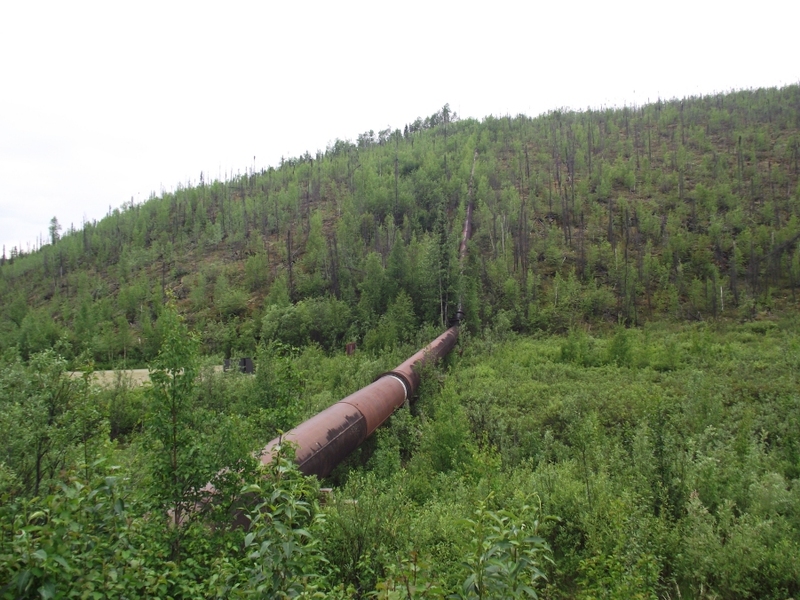 It originally processed ore at the Soo claim north of Fairbanks. 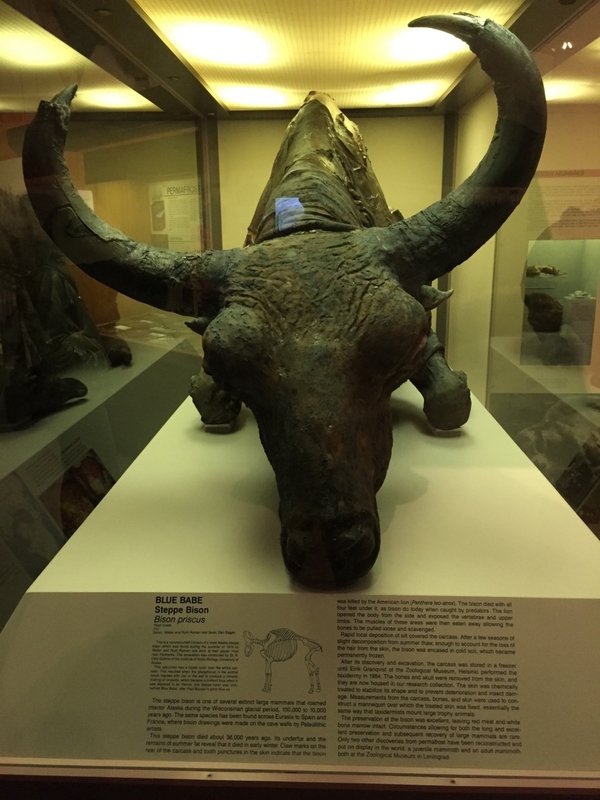 (Above) Perhaps the public’s favorite item in the museum’s collections is the Blue Babe. 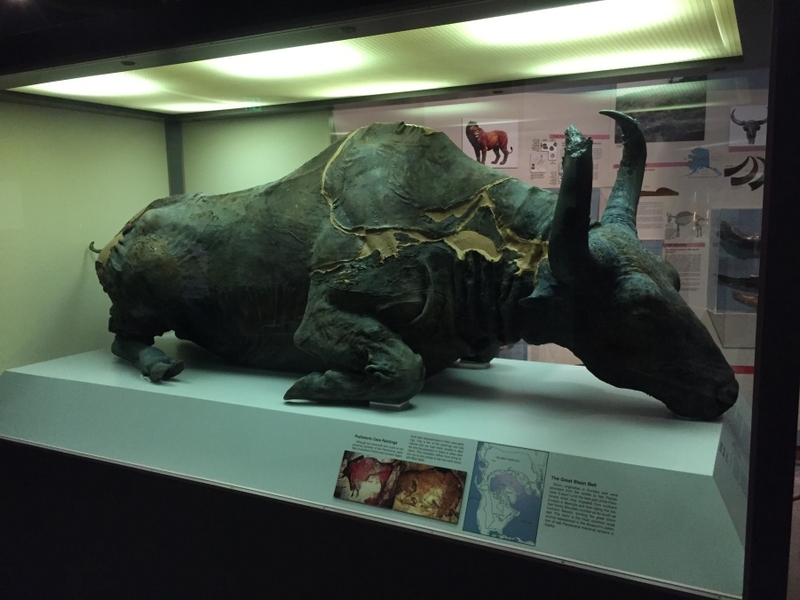 This fossil is a 36,000 year-old Steppe Bison that was killed by an Ice Age lion. (Right) This unusual fossil was discovered and donated to the museum by Walter Roman, a local placer miner, at his mine on Pearl Creek. While fossil bones are common in some placer mines, finding an intact animal is extremely rare. The bluish color is from vivianite, an iron phosphate mineral. Hydraulic placer mining, dredging, and sluicing require large quantities of water. These operations were confined to the warm summer months when water was not frozen. To overcome water shortages, the Davidson Ditch was built in the 1920s to bring water to the Fairbanks District. After the mines were closed in 1958 it was used as a source of hydroelectric power until 1967. 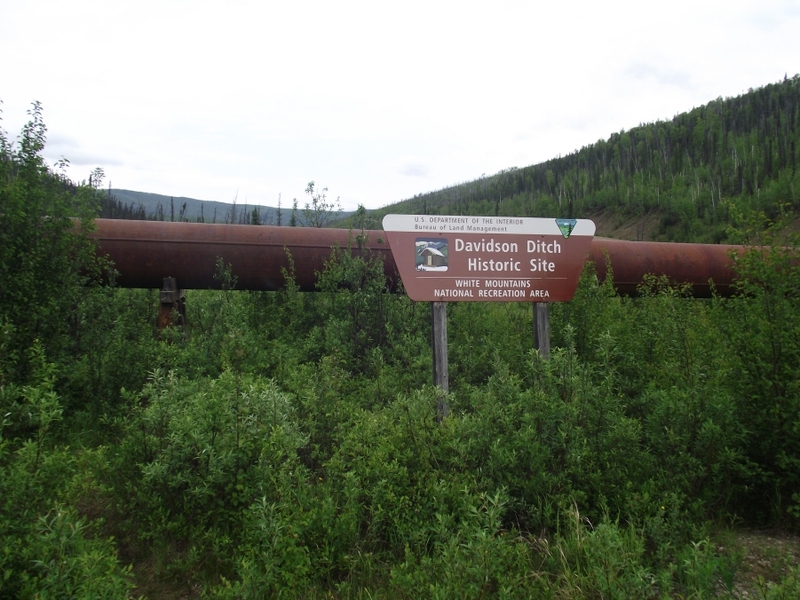 The 90 mile long series of ditches and pipes plus one tunnel conveyed water from the Chatanika River near milepost 64 on the Steese Highway to the Goldstream Valley. Large diameter pipes were used to siphon water across valleys. The Davidson Ditch Historic Site at milepost 57.3 is maintained by the Bureau of Land Management (BLM).